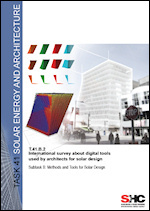 The third report of subtask B presents the capabilities of 19 CAAD and BPS digital tools for solar design, in order to increase overall awareness, and provide inspiration and incentive for the future choice of tool(s). The review was carried out by using the same building model as input for all tools, as far as possible. In addition, the second part of the report presents three exemplary case stories that intend to convey valuable experience as they describe different design approaches, which tools were used and how the use of solar design tools affected the design process and final architectural design. One important outcome of Task 41 is a reach-out to the industry and digital tool developers in the form of a letter, clearly stating the perceived needs of professional architects, as they had been identified through the international survey and by Task 41 experts through experience and research reviews. The second stage of the project aimed at learning from users, i.e. 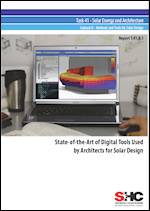 architects, about their satisfaction with currently available tools and methods for solar design, as well as to identify obstacles that they are facing especially during the early design phase. An international survey was carried out in 14 participating countries during 2010. This deliverable is the full survey report, with a description of the survey and a detailed discussion of the results. The first stage of work in Subtask B was to review and analyze the current software landscape available for architects, with a focus on early design phase (EDP) decisions of building projects, and to identify missing software tools and/or missing functionalities required for encouraging and enhancing solar design of buildings and the integration of solar systems and technologies. This report includes 56 software packages which were classified in three categories: CAAD (computer-aided architectural design) tools, visualization tools and simulation tools.